The cleanliness of your hydraulic fluid is critical to the trouble-free and cost-efficient operation of your system. Hydraulic components are very expensive and need special consideration when selecting and filtering this fluid. The ISO 4406 cleanliness level standard is a two number system used to reference the number of particles greater than both 5 and 15 micron in a volume of 1 mL. For example, the approximate rating of new oil off the store shelf would be 18/15. 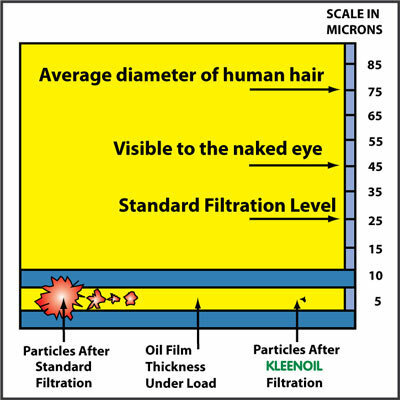 The first number indicates the number of particles larger than 5 micron in size and is used as a reference point for "silt" particles. The second number is the number of particles larger than 15 micron which contribute greatly to potential catastrophic component failure. Ideally, the lower you can get the two numbers in the ISO chart, the less chance there will be of internal damage within your engine or hydraulic system. To ensure that you achieve the most efficient results, it is important to establish and maintain an oil analysis program.